How Does an Electric Fence Work? Considering fencing options is important for those beginning or working to improve their ranch or farm. Different fencing types have their own strengths and weaknesses in addition to having a range of price options. Fencing choices are also dependent on the size and type of animals you have. The best way to make a decision is to review the available options, decide what works best for you, then take the steps to install the perfect fence for your ranch or farm. 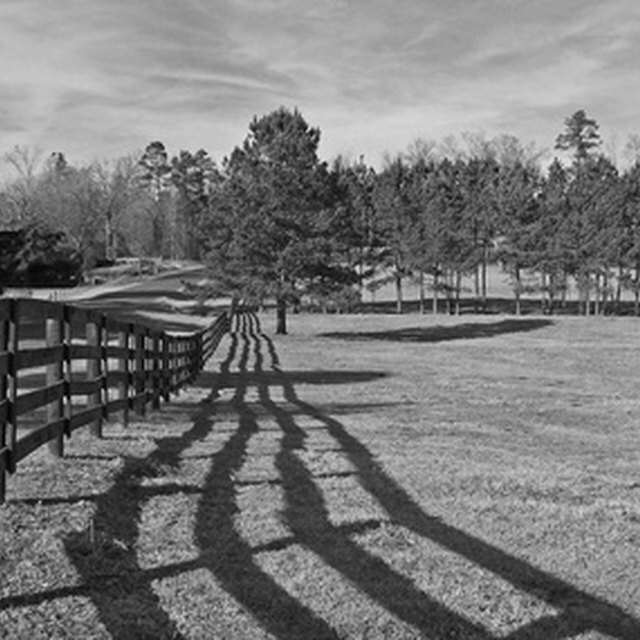 Choosing the right fencing for your ranch is an important process. A wood rail fence is relatively inexpensive and easy to install. It does require routine upkeep, especially if painted. It's a great option for cows, sheep, llamas and even horses--although the stronger, larger animals such as horses can easily break the boards or run through them if spooked. Wood rail fences are made more for keeping your animals in than keeping predators and trespassers out. Vinyl or PVC fencing is a visually appealing option for your farm or ranch, and can actually add property value as well. This fencing requires little to no maintenance and stands up very well to weather. It is great for containing your medium to larger animals, but is easily bypassed by the stronger animals if used by itself. It can also be expensive to install. Although pipe fencing can be expensive to install, it is extremely durable. It's pleasing to the eye and very visible (which will keep your animals from injuring themselves on it). Little upkeep is needed and the pipe fencing lasts a very long time. Once again, a very good option for keeping your animals in. Hot wire and electric fencing serve two main purposes: to keep trespassers out and keep your animals in. These two options are best used with other, more highly visible fencing options. You can use an electric or hot wire fence as a temporary option, but they're not strong enough to hold your animals in, and the shock won't necessarily keep them away when spooked. It is used mainly as a deterrent instead of a restraint. If you choose to use an electric fence, use markers as well, so those working near the fence and your animals are able to see it. Mesh fencing is a structure that uses woven wire placed around a wooden or piped structure. This is the best option for keeping predators out. Just make sure you use a mesh with holes that are too small for your animals' feet and hooves to get stuck in. Keep in mind younger animals as well, as they are the most curious. You can also weave a hot wire through the mesh fence as an added deterrent. Make sure you clearly mark the fencing as well. Catherine Fiorentino began work as a professional freelance writer in 2006. Since then she has written for several online content websites, private clients and blogs. Fiorentino has an Associate of Arts in journalism and mass communication from Kent State University. How Tall a Fence Do You Need for a Coyote?